Its summer, you’re sweating heavily and all you really want to know is why the weatherman predicted this morning that today’s relative temperature would max out to 20°C while it feels more like 25°C. Enter the DHT11, DHT22/AM2302 Digital Temperature & Humidity Sensor from AOSONG – the best way to prove the weatherman wrong! These sensors are fairly simple to use, low cost and are great for hobbyists who want to sense the world around them! These sensors are pre-calibrated and don’t require extra components so you can start measuring relative humidity and temperature right away. One of the greatest features they provide is that both temperature & humidity are measured to the nearest tenth; that is, to one decimal place. The only downside of this sensor is you can get new data from it once every second or two. But, considering its performance and price, you can’t complain. The DHT22 is the more expensive version which obviously has better specifications. Its temperature measuring range is from -40°C to +125°C with +-0.5 degrees accuracy, while the DHT11 temperature range is from 0°C to 50°C with +-2 degrees accuracy. Also the DHT22 sensor has better humidity measuring range, from 0 to 100% with 2-5% accuracy, while the DHT11 humidity range is from 20 to 80% with 5% accuracy. Though DHT22/AM2302 is more precise, more accurate and works in a bigger range of temperature & humidity; there are three things where the DHT11 beats the hell out of DHT22. It’s less expensive, smaller in size and has higher sampling rate. The sampling rate of the DHT11 is 1Hz i.e. one reading every second, while the sampling rate of DHT22 is 0.5Hz i.e. one reading every two seconds. However, the operating voltage of both sensors is from 3 to 5 volts, while the max current used during conversion (while requesting data) is 2.5mA. And the best thing is that DHT11 and DHT22/AM2302 sensors are ‘swappable’ – meaning, if you build your project with one you can just unplug it and use another. Your code may have to adjust a little but at least the wiring is the same! For a little more insight, please refer below datasheets for DHT11 and DHT22/AM2302 sensor. Now let’s move on to the interesting stuff. Let’s teardown both the DHT11 and DHT22/AM2302 sensors and see what’s inside. Humidity sensing component is used, of course to measure humidity, which has two electrodes with moisture holding substrate (usually a salt or conductive plastic polymer) sandwiched between them. The ions are released by the substrate as water vapor is absorbed by it, which in turn increases the conductivity between the electrodes. The change in resistance between the two electrodes is proportional to the relative humidity. Higher relative humidity decreases the resistance between the electrodes, while lower relative humidity increases the resistance between the electrodes. Besides, they consist of a NTC temperature sensor/Thermistor to measure temperature. 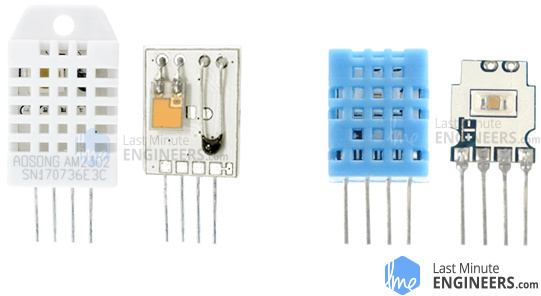 A thermistor is a thermal resistor – a resistor that changes its resistance with temperature. Technically, all resistors are thermistors – their resistance changes slightly with temperature – but the change is usually very very small and difficult to measure. Thermistors are made so that the resistance changes drastically with temperature so that it can be 100 ohms or more of change per degree! The term “NTC” means “Negative Temperature Coefficient”, which means that the resistance decreases with increase of the temperature. On the other side, there is a small PCB with an 8-bit SOIC-14 packaged IC. This IC measures and processes the analog signal with stored calibration coefficients, does analog to digital conversion and spits out a digital signal with the temperature and humidity. How DHT11 and DHT22/AM2302 Works? Let’s briefly discuss how DHT11, DHT22/AM2302 sensors work before we connect it to an Arduino. The DHT11, DHT22/AM2302 sensors use their own (non-standard but similar to Dallas) 1-wire protocol for communication. 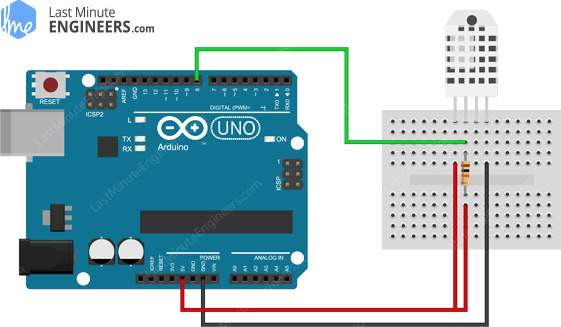 As this protocol is based on the MASTER (MCU, say Arduino) – SLAVE (Sensor) structure, the sensor will answer only when master requests for the data. Otherwise, sensor keeps quiet (remains in sleep mode). To access the sensor, master must follow the sequence of single bus, if there is a sequence of confusion, the sensor will not respond to the master. These sensors (Usually all 1-wire sensors) have open drain outputs so the external pull-up resistor, about 5.1kΩ – 10kΩ, is usually required. So, when the bus is idle, its status will switch to HIGH. This maintains logic “1” when the bus is not driven, just like with I2C. Once the sensor is powered up, it takes up to 2s to become stable. In this period, the sensor tests the environment temperature and humidity, and records relative data. When finished, it enters sleep mode automatically. The communication starts, when the master (MCU) sends out a start signal. With this, the sensor wakes up from the sleep mode, switches to the High-speed mode and sends a response signal. Following that it outputs a string of 40 bits data consisting of relative temperature and humidity values. Once finished, the sensor switches back to the sleep mode automatically, waiting for next communication. The corresponding timing diagram is shown as below. To request a reading, microcontroller pulls the data line LOW for more than 800µs (The typical hold time is 1ms). After this fairly lengthy time, the line is pulled HIGH again but for a much shorter 20µs. This sequence acts as a start signal and awakens the sensor from its idle state. Once the start signal ends, the sensor sends out a response signal. The sensor pulls the data line LOW for 80µs an pulls HIGH again for 80µs. In this period, the sensor re-tests the environmental temperature and humidity, records the relative data and gets ready for the data transmission. When response signal ends, the sensor starts outputting 40 bits serial data continuously. Before sending every bit, sensor pulls the data line LOW for around 50µs. Following that the length of the HIGH pulse decides the bit status i.e. either 0 or 1. If the line is HIGH for 26-28µs, it indicates bit ‘0’, whereas 70µs long pulse indicates bit ‘1’. Once all the 40 bits are transmitted, the sensor pulls the data line LOW for 50ms to indicate the end and enters the sleep mode automatically. Now, comes one of the most mysterious aspects of the sensor: figuring out what the 40 bit data mean. While the relative humidity is always a non-negative number, the temperature might be negative. And don’t forget about the decimal fraction portion of the number. Let’s see if we can solve this mystery. The 40 bit data contains 16 bits of humidity, 16 bits of temperature and last 8 bits represent parity bits (a simplest form of error detecting code) with Most Significant Bit (MSB) first. The corresponding timing diagram is shown as below. The 16 bits of humidity & temperature is actually a 16-bit representation of 10 times the actual humidity & temperature values. The scaling factor of 10 will make more sense in a moment. Consider we received following 40 bits of data from the sensor. It’s always a good idea to confirm if the data received does not contain any errors before proceeding further. Let’s see how a checksum can help pinpoint erroneous results. Here the simple rule is SUM of first four bytes (8 bits) should match last byte i.e. checksum. If this doesn’t match, you should discard the scrambled pattern. This clearly indicates that the received data is valid. 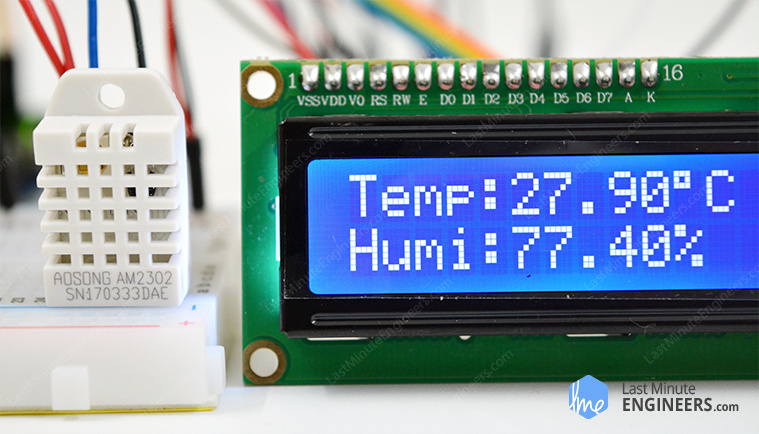 So, now you can proceed with calculation of relative humidity and temperature. To get the relative humidity and temperature, you just need to convert the 16-bit binary value to decimal. That’s it. But remember, these values are 10 times greater than the actual values. So, the final result will be. Voila! There’s the relative humidity and temperature, accurate to one decimal place, shining away at you. VCC pin supplies power for the sensor. Although supply voltage ranges from 3.3V to 5.5V, 5V supply is recommended. In case of 5V power supply, you can keep the sensor as long as 20 meters. However, with 3.3V supply voltage, cable length shall not be greater than 1 meter. Otherwise, the line voltage drop will lead to errors in measurement. 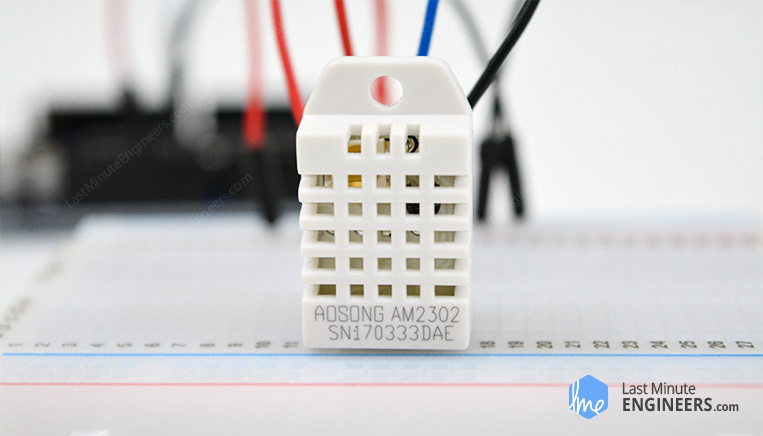 Data pin is used to communication between the sensor and the microcontroller. Now that we have a complete understanding of how DHT sensors work, we can begin hooking it up to our Arduino! Luckily, it is trivial to connect DHT11, DHT22/AM2302 sensors to Arduino. They have fairly long 0.1″-pitch pins so you can easily plug them into any breadboard. Power the sensor with 5V and connect ground to ground. Finally, connect the Data pin to a digital pin #2. Remember, as discussed earlier in this tutorial, we need to place a pull-up resistor of 10KΩ between VCC and data line to keep it HIGH for proper communication between sensor and MCU. If you happen to have a breakout board of the sensor, you need not add any external pull-up. It comes with a built-in pull-up resistor. With that, you’re now ready to upload some code and get it working. 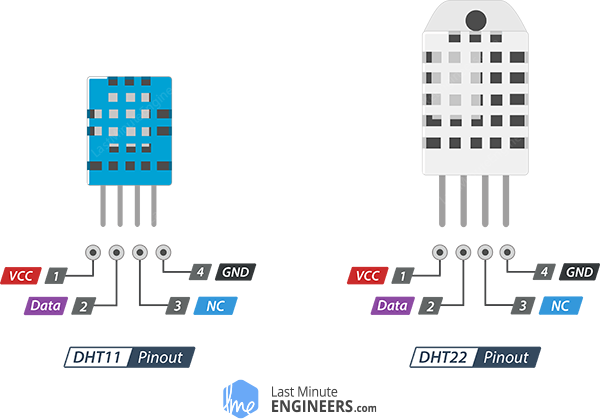 As discussed earlier in this tutorial, the DHT11, DHT22/AM2302 sensors have their own single wire protocol used for transferring the data. This protocol requires precise timing. Fortunately, we don’t have to worry much about this because we are going to use the DHT library which takes care of almost everything. To install it, open the Arduino IDE, go to Sketch > Include Library > Add .ZIP Library, and then select the DHTlib ZIP file that you just downloaded. If you need more details on installing a library, visit this Installing an Arduino Library tutorial. Once you have the library installed, you can copy this sketch into the Arduino IDE. 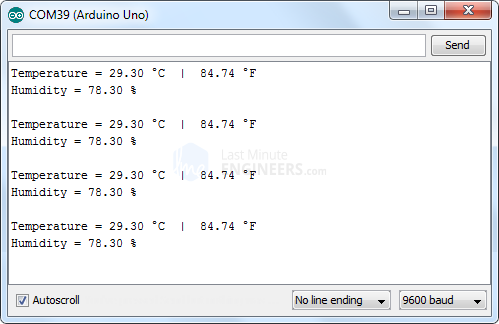 The following test sketch will print the temperature and relative humidity values on the serial monitor. Try the sketch out; and then we will explain it in some detail. //Uncomment whatever type you're using! The sketch starts by including DHT library. 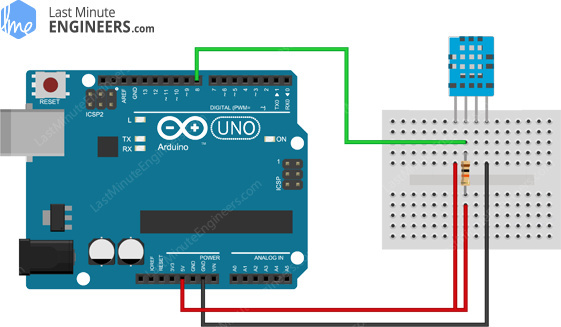 Next, we need to define the Arduino pin number to which our sensor’s Data pin is connected and create a DHT object. So, that we can access special functions related to the library. In the ‘setup’ function; we need to initiate the serial communication as we will use the serial monitor to print the results. In the ‘loop’ function; we will use the read22() function which reads the data from the DHT22/AM2302. It takes sensor’s Data pin number as a parameter. If you are tinkering with DHT11, you need to use read11() function. You can do that by uncommenting second line. At the end we will print the temperature and the humidity values on the serial monitor. Sometimes you come up with an idea where you want to monitor temperature and humidity levels in your DIY incubator. Then you’ll probably need 16×2 character LCD to display prevailing conditions in your incubator, instead of a serial monitor. So, in this example, we’ll hook the LCD up to the Arduino along with the DHT11, DHT22/AM2302 sensor. In case you are not familiar with 16×2 character LCDs, consider reading (at least skimming) below tutorial. 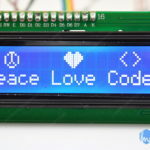 Next, we need to make connections to the LCD as shown below. The following sketch will print the temperature and relative humidity values on the 16×2 character LCD. It uses the same code except we print values on LCD.